More than half of my students came to class without materials. I tried to teach a lesson but those without their materials thought that it was free time. No matter what interventions I used, I couldn't seem to get them back on task and they seemed to take exception to my expecting them to be. "Why do you keep asking me to stop talking to my friends, interrupting the class and generally being rude?" they seem to ask with their eyes. My temper flared and I lost it. I had them sit silently while I called them up one at a time to check their workbooks, answer questions and clarify concepts. What I found was that almost none of the students were going back and correcting their work based on the feedback that I'd been giving them. They wanted opportunities to bring up their grades, but then didn't take advantage. The other thing I noticed was that out of the few who DID change their answers, they all had exactly the same wording for the problems. I don't mind when students work together, but blatant copying and insisting that they didn't is insulting. "You are telling me that you didn't copy?" "No! I didn't copy anything!" "Then tell me what this word means." In 8th period, I checked to make sure they had their books before they entered my room. They did an excellent job of coming prepared today and I thanks them for it. Then several students had to be removed from the class for constant disruption. I talked to the rest of the students about my frustration at my failure and inability to give them the best education that I can. The hardest part of keeping this blog, aside from the constant writing, is that I have to acknowledge my role in the shortcomings of my classes. I KNOW that I'm doing what I think is best, but more often than not, my anger and frustration at my students has become more self-directed. They come in with whatever they come in with. I can't control any of that. All I can do is try to set tone and expectations for my classroom. When my students don't respond the way that I want them to, it's very hard not to feel as though I've failed. At the same time, I've been pushing for growth mindset with them and I need to practice what I preach. Failure is not only acceptable, but necessary for improvement. I also know that education is a long game. My goal is to have my students improve from September to June, and that isn't always a linear process. I need to work on pulling back. I need to work on seeing the bigger picture and not focus on the small. Georges Seurat was a pioneer of the painting technique known as Pointillism, where multiple dots of a single color blend together at a distance to create a masterpiece. 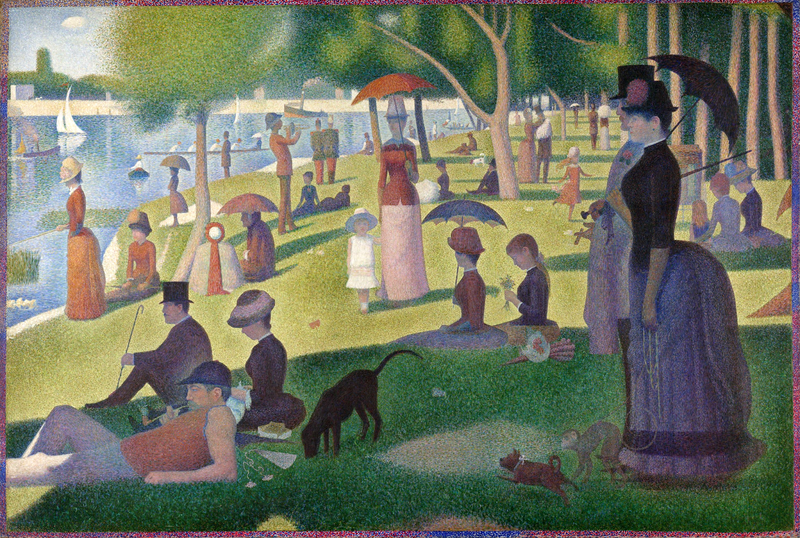 Seurat's famous painting that demonstrates this technique is A Sunday on La Grande Jatte and is well known to many. Perhaps a better analogy, rather than Pointillism, would be a photomosaic. A picture composed of snapshots rather than single dots of color seems more appropriate to this situation. Either way, the conclusion remains the same. I have a greater vision for my classes, for my students, but I am deeply struggling with keeping that vision in the forefront in my mind. I need to take a step back and view the entire painting. I need to keep my perspective. I've been trying to remind myself to maintain a growth mindset as well. This is my first year teaching middle school math (came from 3 years of 5th grade) and I'm trying lots of different things (including Dan Meyer 3 Act Problems as well as a couple projects in the year). Currently, my 6th graders are working on a proportions project that's taking forever and they're enjoying it and there's math involved but I really wonder if they're going to have the skills I was trying to teach through the project. That's one of the biggest reasons I usually err away from projects- they take up so much time and it's hard to structure it so you know they get the skills you were shooting for. All that to say, it's hard to do a project perfect the first time. Trying to have a growth mindset as well. And yes it's frustrating when students don't show up prepared.